Today Is A Great Day To Paint ! In 1999, Color Town introduced what was then a unique concept – renting paint. Back then, you would rent a quart and use enough out of it to try the color on your wall. This evolved into paint samplers, where we would pour 4 oz of premium latex eggshell into a sample pot in any of our paint colors. In 2003, we became members of The Coatings Alliance who brought to us two great innovations: oversized 3 square foot paint chips and sample pints which we could mix in any color. Paint sampling is something we strongly recommend! Colors can change drastically from store to home, or even room to room. It is so important to see the color in your own space with your unique lighting conditions. Today, we have sample pints from C2 Paint and Benjamin Moore and sample quarts from PPG. 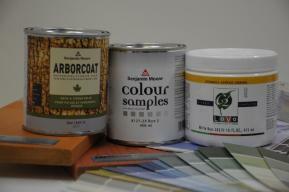 Paint sampling gives you confidence in your choice and can save you time and money. This might be of help to you! Looking to paint and decorate a room but not sure where to start? Well, Colortown is here to help. Take a look at our gallery to gain inspiration and creative ideas, to create a room that you will love. Color Town works with individuals who are passionate about color! Contact us today to book your color consultation or learn more about our service by clicking here.